» Prettier streets, but at what cost? Prettier streets, but at what cost? This and other intersections would get curb extensions. On the right, the old post office. From the standpoint of visual excitement or esthetic appeal, the streets of downtown Albany don’t set any records. You might even say they look kind of drab, especially on a rainy day in March. The city wants to do something about this and is willing to spend nearly $8 million to get it done. 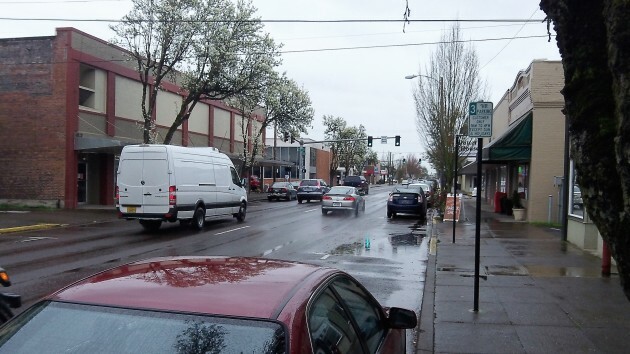 The program envisions new sidewalks and many other upgrades on Second and Third avenues and on Lyon, Ellsworth and Broadalbin streets. This part of Ellsworth would get vegetated landscape strip. Lyon and Ellsworth are also to get $800,000 worth of vegetated landscape strips from First to Fifth. The sidewalks are not exactly extra wide as it is, so I’m wondering where these planter strips are supposed to go. The plans call for new “acorn lighting” all around. As we’ve seen on First and elsewhere, street lamps of this kind don’t shed much light; decoration is what they are meant to provide. All this is supposed to encourage a commercial revival similar to the proliferation of restaurants on First Avenue, where a similar sidewalk project was completed early in the last decade. But except for one block on Second, the rest of these blocks lack buildings suitable for a revival of that kind. The old post office and city hall? The new city hall? The city’s Two Rivers parking lot? Various banks? Postscript: Staci Belcastro, a city engineer, says that design for the CARA street program is currently underway and construction should start in late spring or early summer 2017. All this means is that Conservatives need to be dragged kicking and screaming into the 19th Century, much less the 21st. Mr. Woods: Why the vitriol? Why should government (the people) pay for prettier streets? If you want to donate your money fine. We’ll call it “a walk in the woods” You seem to have plenty of mouth, do you have plenty of money, too? 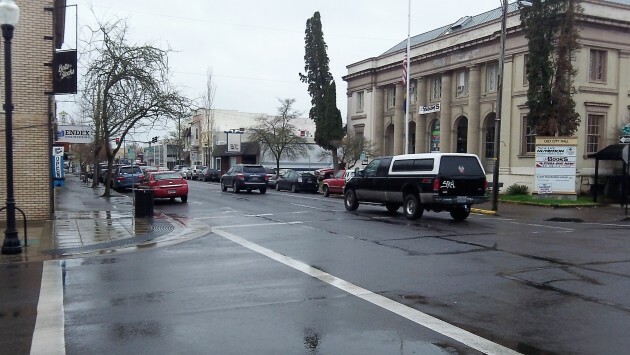 The government should pay for prettier streets because the government OWNS the streets. All it takes is to look at communities that invested in improving their infrastructure and you will find that those communities become ore prosperous. It’s no different that property owners who paint their houses, mow the grass,and update their properties to meet the times. 15 years ago downtown was a dump with failing businesses..Now it’s vibrant and growing. All because of the investments made by the public and the private sector. And that only happened when the people quit listening to the “do nothing” Conservatives and turned to the moderates who wanted to actually build a better future. And the cost? Well, that’s the good thing about Urban Renewal Districts: It doesn’t cost you any more than you would have paid in taxes anyway. It just dedicates some of that money towards repairing what is failing and improving to match current needs. Bob, you are perpetuating the old line, URD”S are not even close to free, you would have a point if all the money received by the URD was that amount that was due to the increase in value due to changes in the URD> but it also gets ALL of the INFLATION due to the devaluating of the dollar and all the other reasons. A URD that was started 20 years ago got the tax base that was in effect at the time, which paid for the expenses of running the city. Diesel cost 50 cents a gallon 20 years ago, last year it cost $4.00 per gallon, that difference comes from all of the city. So CARA got the money and the rest of the city had to backfill the tax to buy $4.00 diesel to put in the street sweeper….to sweep the CARA district..
1) Never said it was free, said it was a decision to spend money for a certain purpose in lieu of spending it in other ways. The same as EVERY decision made by the City Council on EVERY budget decision as you well know. I wanted to reply to your message, Rich, and clarify a couple of things. The information is incorrect. We will not be doing away with 30-40 parking spaces. During the CARA Board discussion in December related to the streets project, the curb-extensions, or bulb-outs, were added back in to the package. However, the discussion was that these would be designed in a way that they not impact parking, especially in the downtown core. The accurate numbers from the current design are 3 spaces lost in downtown (non-highway blocks) and 0-6 spaces lost on Lyon and Ellsworth (depending on design), with three new spaces being added in front of Fire Station 11. The net result for the entire streets project is a range of losing as many as 6 spaces, to a net loss of zero spaces. Come on Bob, check your ego. What businesses do you actually patronize downtown? I go to the post office, a bank and occasionally the Carnegie Library. I don’t think I’m that much different than most citizens of Albany. Where do you go downtown that you find million of dollars in value? A barber shop? An antique mall (pretty fun a couple times a year)? A museum that got started years too late? Do you often buy bikes? (Sorry Hasso, you’ve an enviable collection) Do you frequent lawyers offices? Visit the carousal monthly? I enjoy the hanging baskets in the summer and the Christmas decorations in winter. You seem to want to start an argument where none is necessary. Please suppress the ego and be intellectually honest. So we want to attract more business and activity downtown, which is good, and at the same time delete tons of parking? I don’t understand how this will work. Uggh. We went through this bulb-out waste 10 or 15 years ago! The city installed some, the citizens opposed them. The city said it was ‘state’ or ‘federal’ money (I forget which), so it is not waste. The citizens said waste is waste no matter how or which taxpayers pay. The city decided not to add further bulb-outs. Now, they are considering adding these again! I understand bulb-outs are perceived as safe measures — primarily as a traffic calming or slowing device. They work by narrowing the roadway, forcing drivers to slow down. They may be suitable for some locations, but any minimal decrease in crossing risk needs to be balanced with other considerations on how they impact the safety and traffic flow of pedestrians, bicyclists, and all vehicles. 4) They make it more difficult for autos to navigate the corner — especially large vehicles, including emergency vehicles, fire trucks, delivery trucks, etc. 5) What is the impact on bicycle riders who would need to move further into traffic to get around the bulb-outs? It seems logical to me that these would increase the risk for bicyclists as it pushes them closer to automobiles. 6) they are incongruous within an historical district! I am very disappointed to see this idea resurfacing. All this is connected to the fact that volunteers like to use other peoples money to make themselves feel good. One of the major reasons that business left downtown is ease of parking, they went to places where it was easy. where it is safer, parking next to moving traffic is more dangerous than in a parking lot because you are opening your door into traffic, then stepping into traffic, angled parking is safer to people getting out of cars but was found to be unacceptable by CARA. Without the big anchors, downtown suffered and lost other business. Putting in bulb outs as a safety feature is questionable. without the bulb out a driver can see a person starting to move in a crosswalk before the person is in the traffic lane. With a bulb out, the very first step is into the traffic lane that may or may not be safer. This among other reasons is why I voted against the plan. Too expensive, The CARA board seems to be driven by the emotion half of their brain with too little influence by the logic side. More promenade. Sorry Rich, that’s just not true. 15 to 20 years ago there was plenty of parking available, because no one was going downtown. Downtown was run down and didn’t have the businesses that drew patrons there. If you want safer cleaner places to park the it’s time to talk about parking structures on existing parking lots to increase the supply.Blaming bulbouts is just clinging to past battles instead of looking at options that can easily double or triple available parking, if parking is needed. Parking structures become public toilets for the homeless. Safe? Maybe if you have armed guards patrolling. Parking structures, where did that come from???? they went to the Mall..
I’d suggest those living in the “CARA District” with broken streets & sidewalks photograph them. Print them out and show up at the meeting. Make them justify tearing out serviceable sidewalks etc., while ignoring very needed street repairs. Obviously, if you don’t live in a “CARA District”, you simply don’t matter to this administration.